An aerial view provided by AIR7 HD of Chapman University at 1 University Drive in Orange. 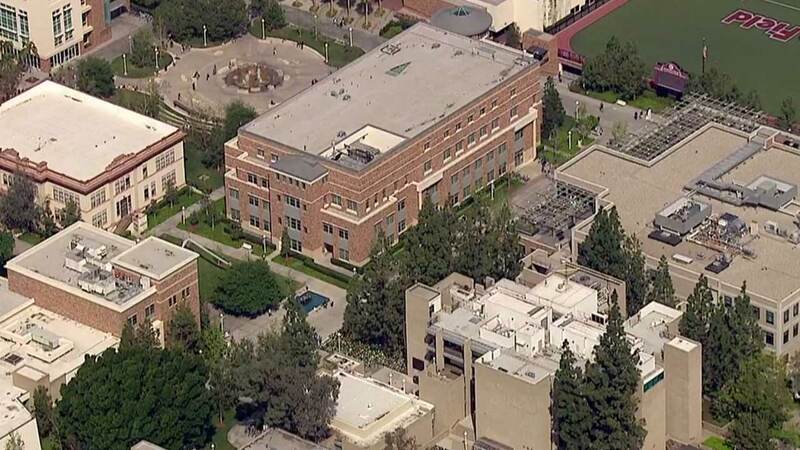 ORANGE, Calif. -- A man was reported to have a possible handgun at Chapman University, but after an extensive search, the school was later deemed safe, school officials said. The sighting happened around 7:13 p.m. on campus located at 1 University Drive, according to Mary Platt, a university spokesperson. Campus officials said the suspect was reportedly seen with a handgun in his left hand near DeMille Hall, and all students inside were asked to shelter in place. All others in the general area were asked to evacuate. The suspect was described as a man with short black hair, 25 to 30 years old, 5 feet 10 inches tall and weighing about 180 pounds, with a red, yellow or orange sweater, Platt said. GO TO https://t.co/DEWywMZkZ2 for all official updates about the situation on campus. Updates will be posted as soon as possible. A statement published on the school's website read in part: "Chapman University takes every threat seriously. With recent events in other parts of the world, we do not want to alarm you, but we do want to communicate that there has been a reported possible threat situation that Orange law enforcement is investigating."